The Port Townsend Farmers Market is pleased to be part of the Olympic Peninsula Apple and Cider Festival again this season. 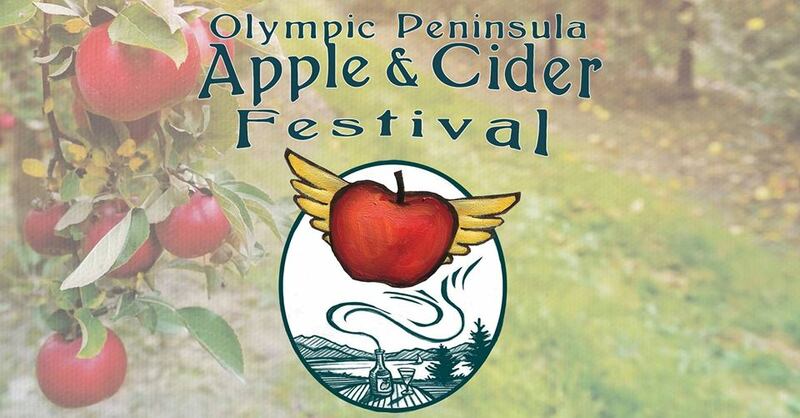 The Olympic Peninsula Apple and Cider Festival celebrates the traditions and culture of growing apples and fermenting cider with a truly authentic Pacific Northwest, tree-to-glass weekend experience. Check out the full weekend details here www.AppleAndCiderFest.com. This Saturday at the Port Townsend Farmers Market we are celebrating local apples and fermentation with a chef demonstration by Jefferson Healthcare's Executive Chef, Arran Stark, as well as cider and wine tastings from Eaglemount Wine and Cidery, Port Townsend Vineyards and visiting Chimacum Farmers Market vendor, Hurricane Hills Winery. We also have localy grown apples available from Finnriver and SpringRain Farms as well as fermented drinks from the above listed hard cider and wine producers as well as, for those of you looking for something nonalchoholic, kombucha from BluJay Kombucha. If you want to take the fermentation theme a little further, pick up some sauerkraut or kimchi from Midori Farm to go with your cider and apples. Yum! Shoppers, if you use WIC/Senior Farmers Market Nutrition Program (FMNP) vouchers, this is your time to use them up. FMNP checks expire at the end of this month. Don't forget to bring them to the Port Townsend and Chimacum Farmers Markets and spend them! Most of the growers at our Port Townsend and Chimacum Farmers Markets accept FMNP. Load up on fresh, healthy fruits and veggies this weekend and before the end of the month. Please visit the market information booth if you have questions about how to redeem your FMNP checks. Starting this weekend, the Jefferson County Farmers Markets are pleased to offer shoppers using SNAP/EBT (formerly known as Food Stamps) extra matching funds. With support from community sponsors and individual donations, we are adding an additional $5 in market tokens when you spend $25 on your EBT card through the end of the Port Townsend and Chimacum Farmers Market seasons. Combined with our Fresh Bucks match, this means you spend $25 and we give you an extra $20 for farm-fresh food, a total of $45 to spend on healthy food from your local farmers markets! Want to support your friends and neighbors in accessing healthy, locally grown food from the farmers markets? Visit the Give Jefferson nonprofit catalog and make a donation to the Jefferson County Farmers Markets today. All donations through the Give Jefferson campaign will go directly toward our food assistance programs--Gimme5 and VegRx. These programs foster greater community health and food security for Jefferson County residents with low incomes. Thank you! Fiddlehead Creamery. This Saturday is the last market day of the season for Come get a scoop of their seasonal flavored coconut-based ice creams. Yum! One Straw Ranch has some new sausage flavors for you to try! We’ve added Spicy Italian, Polish, and Hot Links as well as Regular and Spicy Italian bulk sausage. We still have the favorite Bratwurst, Chorizo, Breakfast and Ginger Pear sausages. Help us decide which new sausages to add to the permanent lineup! We also have uncured pork shanks and sliced uncured pork belly in stock. Saturday, October 13th, Olympic Apple and Cider Festival at the Port Townsend Farmers Market, 9am-2pm, Tyler Street. In partnership with WSU Extention, the Silverwater, the Fireside at the Inn at Port Ludlow, the Local Food Council, the Olympic Culinary Loop, Ajax Cafe, and Eat Local First, the Jefferson County Farmers Markets are co-hosting a Local Food Expo on Sunday, November 4th at the Port Townsend Community Center. The first half of this event is geared towards connecting chefs and commercial buyers with local food producers. The second half of the event connects local eaters with Community Sustained Agriculture (CSA) shares. Mark the Local Food Expo on your calendar and register today. This is a free event. Farmers and food producers, registration is due by October 19th. Learn more and register here.